With the group email feature, you can draft an email message within Formdesk and send it to everyone that completed your form. Use group email, for example, to send the results of a poll to your respondents. 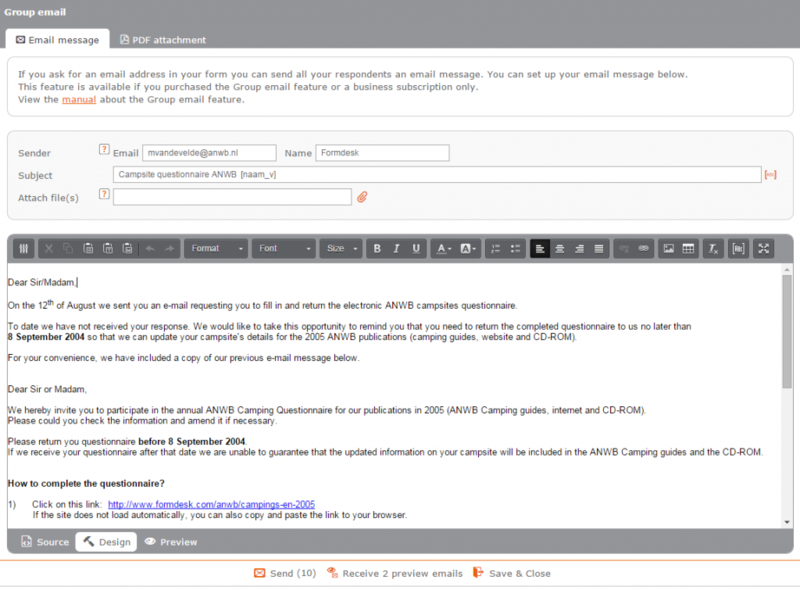 You can also send the message to email addresses you imported, for example to invite people to complete a form. In that case the form may already be partially filled out. You can include merge codes within the email message. This lets you personalize your email messages or send a copy of the completed form to your respondents. If you would like to send out invitations for people to complete a form but their email address is not yet registered in Formdesk, you will first have to import the email addresses. More information can be found in the manual Sending Invitations to complete your form. By applying filters, you can narrow your target group. For example, send an email message to everyone who indicated wanting to make use of bus transportation to inform them of the exact time and place of departure. Using the PDF generator you can send out an email message to (a selection of) your respondents with a PDF attachment containing, for example, a contract or an invoice for subscription renewal. This add-on is included in all business subscriptions and can be purchased for €99 per year in addition to a standard subscription. If this add-on is not part of your subscription, you can still try it out by sending out 2 test emails to yourself. If you have a trial account and wish to take full advantage of this feature, we would be happy to activate the feature for you. You can request activation using the ‘Help request’ button in the bottom right corner of the screen from within your Formdesk account.